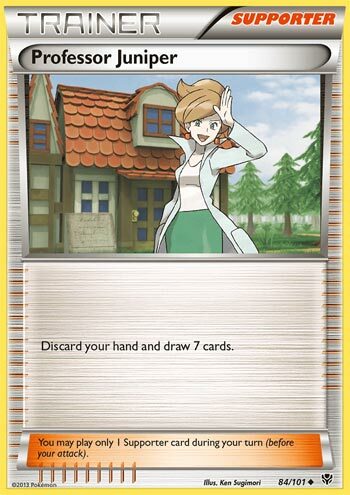 Home Featured Articles Professor Sycamore – Influential Card About To Be Rotated Soon. Professor Sycamore – Influential Card About To Be Rotated Soon. Professor Sycamore is the card that I picked as the most influential card lost to rotation. I guess I can include Professor Juniper as well since she does the same thing even though she was rotated out in September 2015. 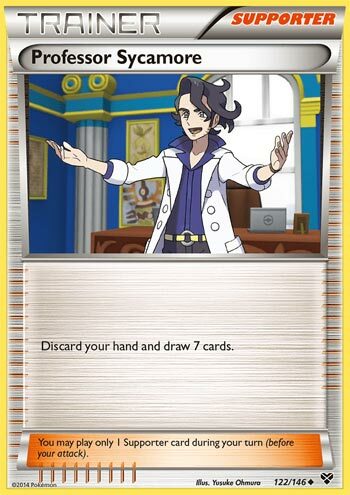 They both have the effect of discarding your hand and draw seven cards, just like what Base Set Professor Oak did, except both Professors are Supporter cards while Professor Oak was an item card and can be used as many times as you like during your turn. I remember back in 2011 when I saw Professor Juniper had the same effect as Oak, but as time passes, I realize that moment of excitement turned into something that I must keep and not trade it away. So why is this card the most heavily missed card and that we probably won’t see one like this for a very long while based on cards that we saw on various Sun and Moon expansions? Before Professor Juniper was released in Black and White, the HGSS/DPPT era cards (at least where I was exposed to the Pokémon TCG at the time, so that’s how far I would be able to recall) didn’t have a lot of straight draw cards. Decks even have Supporters that searched for cards such as Roseanne’s Research, Bebe’s Search, or Pokemon Collector. Some were shuffle based draw like Judge or Professor Oak’s New Theory, so a deck would need to have some Pokémon whose Pokemon Powers needed to have some sort of straight draw. Uxie and Claydol were some of the best beneficiaries to be seen in almost every deck due to consistent ability based draw that works every turn. The Supporter cards I can think of that actually does straight draw between the DPPT and HGSS series includes, but not limited to, Professor Oak’s Visit (draw three cards then put one card from your hand to the bottom of your deck), Buck’s Training, Mom’s Kindness/Bill (draw two cards), Emcee’s Chatter (flip a coin. If heads, draw 3 cards; if tails, draw 2 cards), Cheerleader’s Cheer (draw 3 cards, your opponent may draw a card), and Engineer’s Adjustments. I find Buck’s Training and Engineer’s Adjustments to be the best straight draw cards for what the available card pool was at the time. Buck’s Training is a weaker Professor Kukui, drawing 2 cards while doing 10 more damage to your opponent’s Active Pokemon. Engineer’s Adjustment requires you to discard an Energy from your hand in order to draw 4 cards. A slightly better Sophocles card! So there’s wasn’t any crazy amounts of speed happening at the time. Enter Professor Juniper, and the perspective of Supporter cards has completely changed. No longer decks needed search related cards, they just passed the responsibility to item cards. You’ll see deck’s with 4 Professor Juniper, 4 N, and maybe some Professor Oak’s New Theory when it’s still legal. Do you still see other search Supporter cards? Nope. No Professor Elm’s Training Method and Sage’s Training isn’t here either. The deck need something fast, even it it nets you seven random cards. Sure, the discard hurts, but learning how to minimize that pain makes it not too much of a drawback. Something like using your current cards that you have for that particular turn such as Ultra Ball, recovery items like Super Rod, Pokemon Tools, and/or energy attachments before playing that Juniper down because cards are going to be discarded anyways, even if you didn’t play it. There’s a lot you can do with seven cards: manual energy attachments, putting Pokemon into play, evolving them, using as many item cards as you like that could get you even more cards, and others. Even ability based draw didn’t see as much play for fear of being captured up front via pre-errata Pokemon Catcher and getting OHKOed. Electrode (BW Plasma Freeze) had Magnetic Draw that draw cards until you have four cards in your hand, and yet that wasn’t enough to see play. Delphox XY was better, drawing until you have six cards in your hand, but she’s a Stage 2. Octillery, on the other hand, is a Stage 1 that draw cards until you have five cards in your hand, and this was seeing lots of play than the other two. As for item cards, they seem to oust many Supporter cards that does a similar job because they can do a efficient job and leaves room for you to play a Supporter. Some item cards may have some drawback, like discard certain cards in order to accomplish a particular effect, or require some amount of luck on your side due to coin flips, but that still doesn’t stop them from using them. Pokegear 3.0/Xtranceiver/VS Seeker for fetching supporters; Ball related items like Dual Ball, Level Ball, Heavy Ball, Dive Ball, Timer Ball, and Ultra Ball over Professor Elm’s Training Method, Trevor, Olivia, or Pokemon Collector for fetching Pokemon; Super Rod/Sacred Ash/Energy Recycler over Flower Shop Lady/Brock’s Grit for recovery; Max Potion over Pokemon Center Lady; Professor’s Letter over Cilan for basic energy search. The “once Supporter per turn” has heavily placed a burden to most Supporters trying to see play, and looks like only four Supporters during the 2011-2012 season would be in almost every deck: Professor Juniper, N, Colress, and Professor Oak’s New Theory. Even Twins/Teammates didn’t cut it because the net amount of cards you’ll get from your deck is very small. In the end of the BW era, when there wasn’t going to be any printing of Professor Juniper, they printed Professor Sycamore for XY. And what effect that they decide to use? Same as Professor Juniper! Discard your hand then draw seven cards. There was a ruling where you cannot have Professor Juniper and Sycamore in the same deck. Imagine if you did have four of each. You would’ve decked out and lose. XY did have some handful Supporters that aren’t Draw related like Lysandre (he would’ve never see play if Pokemon Catcher didn’t get its text changed), Pokemon Ranger, or Hex Maniac. On the other hand, other draw related supporters did pop up like Giovanni’s Scheme, Psychic’s Third Eye, and Shauna. These don’t see as much play but are not totally hopeless. Professor Sycamore/Juniper is never going away, they have been universally used even when other supporters try to find a reason to see play. This is why, with tons of examples that was listed on this review, I came not to praise this card, but to rant about how Professor Sycamore is unbalanced and leaving very little room for innovation. Seriously, name one competitive deck between 2011 to 2018 that doesn’t use Juniper/Sycamore. Nope, every deck has one, some running two copies, three copies, and definitely a full four. That just shows how fast the format is. Even though I complained about how Sycamore/Juniper is too powerful, their Achilles Heel would be tossing cards that you may actually need much later in the match, possibly costing you the game if you couldn’t recover those cards. Having two or more of these Professor cards in your hand means you missed at least one opportunity to use it again because the second, third, or even the fourth professor in your hand was forced to be tossed. Hence why you need cards that recovers Supporter cards like Pal Pad or VS Seeker to get some back. Besides those hiccups, there was no reason not to run Sycamore/Juniper because this is perhaps the best draw Supporter the format had to offer. So what will happen when Professor Sycamore leaves Standard? Well, we got Cynthia for shuffle based draw, but probably the next straight draw card would have to be Sophocles, Looker, Professor Kukui, or Hau. Sophocles makes you discard two cards in order to draw 4 cards while Hau is your typical Cheren/Tierno of drawing three cards. Looker draws three draws from the bottom of your deck, which would be handful in a few decks like Oranguru’s Resource Management. Professor Kukui draws 2 cards, but also boost damage output by 20. With crazy draw power out of the picture for the Sun and Moon-on format, the pace will finally start to slow down a little. As for Expanded, however, professors will continue to see heavy play because it will remain legal there forever, as far as Expanded goes. That format won’t rotate expansions, but will aggressively monitor and determine which cards are unhealthy for the metagame. So far, three cards have been banned in Expanded: Forest of Giant Plants, Lysandre’s Trump Card, and Archeops from Noble Victories. So it looks like they’re doing a good job on keeping the format healthy. I don’t think Sycamore or Juniper is going to be banned, but if it does, then it leaves a lot of room of other Supporters to be considered using. In Limited, regardless of expansion such as XY, XY Phantom Forces, XY BreakPoint, or XY Steam Siege, this is a very good pull and a must run. Being able to draw 7 cards from a 40 card deck would mean limited matches can go by quickly. Unfortunately, those prerelease are long gone, since we’re reviewing cards lost to rotation. I won’t rate Legacy even though I’ve mentioned Professor Juniper here because this review is about Professor Sycamore. He is not legal in Legacy, but Juniper, on the other hand, will see play everywhere in Legacy. Notes: Professor Sycamore will be missed, that’s for sure. He and Juniper had an amazing 7 year run with their effects, and unless we have something in Sun & Moon that replaces them or fills in the gap, I fear we won’t be going to have a card like this for a long time. At the same time, I’m glad their gone, because Standard will open up to other Supporters who has a reason to see play due to their unique effects, even if it’s outclassed. Wrapping up this countdown also means be bid farewell to the remains of XY and their archetypes and other cards we didn’t mention in this countdown. The EX, Mega Evolution, and the Break mechanic will be retired from the Standard format. The Sun & Moon onwards would be similar to the ex-era from Ruby & Sapphire but with some added twists: GX Pokemon acting similar to old ex-era cards, Prism Star cards, and no “dump your hand & draw 7” style variants. Well, looks like I don’t have to rewind back in time; I can experience 2018 as if it was 2003!